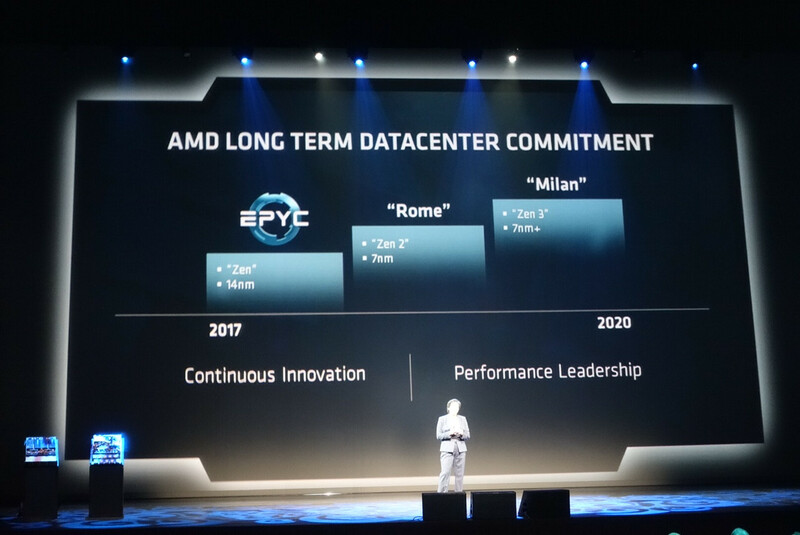 AMD's EPYC Launch presentation focused mainly on its line of datacenter processors, but fans of AMD's new Vega GPU lineup may be interested in another high-end product that was announced during the presentation. 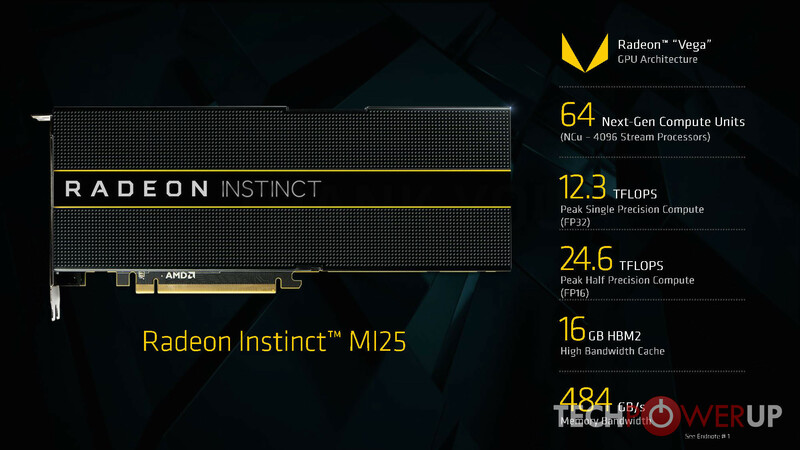 The Radeon Instinct MI25 is a Deep Learning accelerator, and as such is hardly intended for consumers, but it is Vega based and potentially very potent in the company's portfolio all the same. 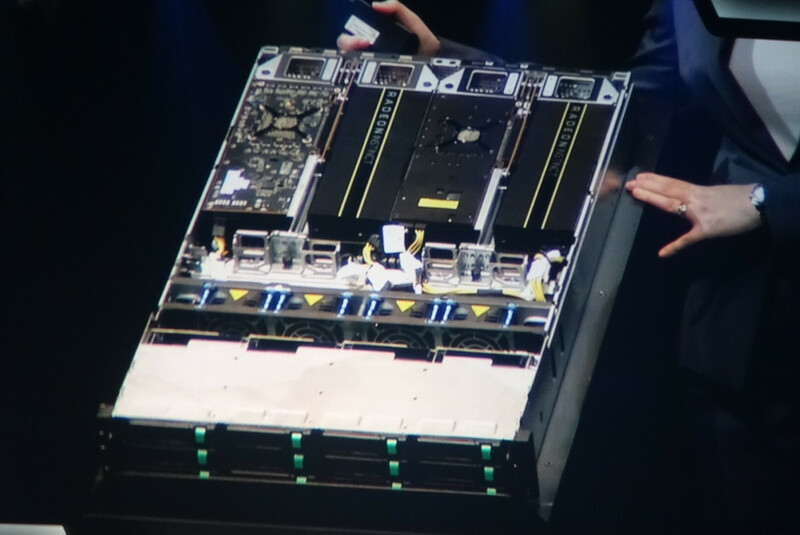 Claiming a massive 24.6 TFLOPS of Half Precision Floating Point performance (12.3 Single Precision) from its 64 "next-gen" compute units, this machine is very suited to Deep Learning and Machine AI oriented applications. 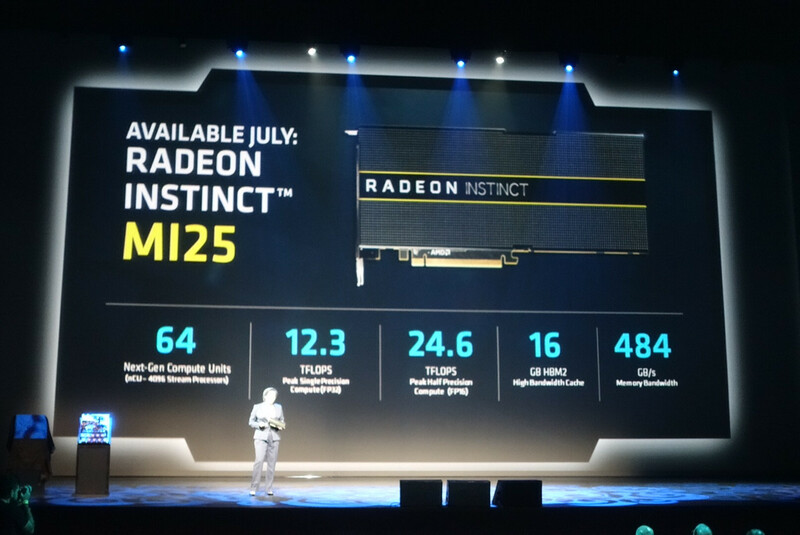 It comes with no less than 16 GBs of HBM2 memory, and has 484 GB/s of memory bandwidth to play with. 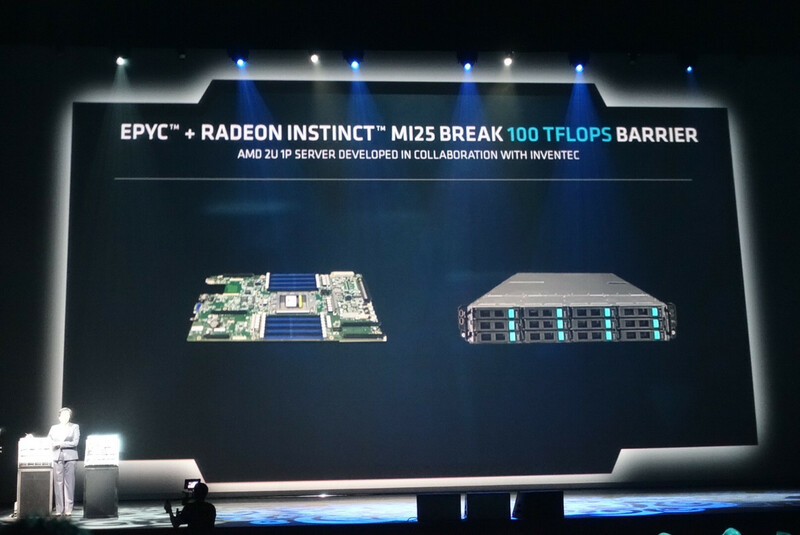 AMD also presented a 2U server rack with EPYC processors and Radeon Instinct MI25 GPUs on-board that they have co-developed with Inventec. 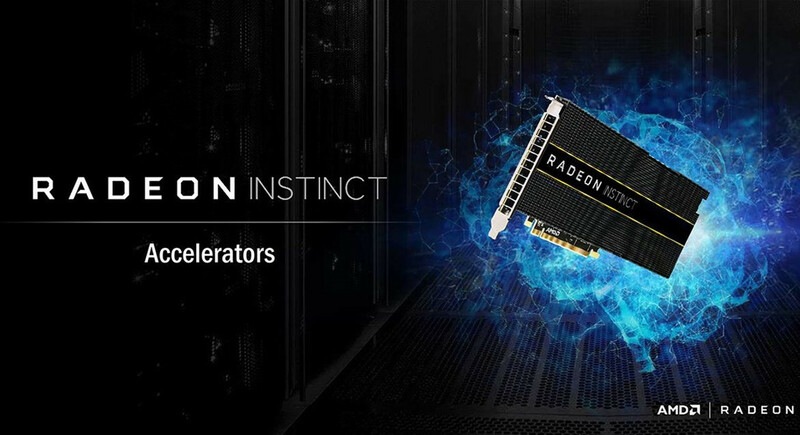 It is capable of a staggering 100 TFLOPS of performance. 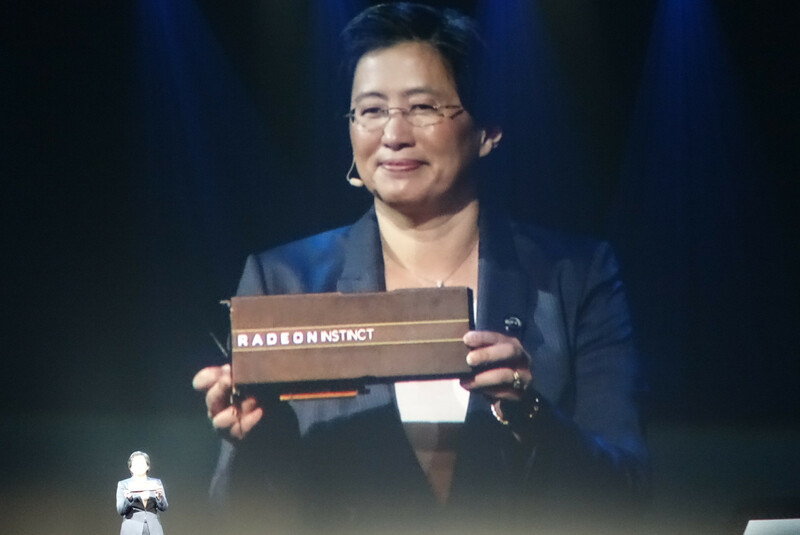 It is certainly encouraging to see AMD launching competitive products in this market segment. At least they aren't bellyflops. A question: do you remember "Vega cube"? Where is ? Why is one backplated and the other not? Fitting problems for the platform? P.S. Wait, not even the same PCB? I'll wait for Zen 2 then, since I will have to wait until Jan/Feb 2018 anyways as this is the projected delivery date of the A4-SFX v2. Will be interesting to see what progress AMD and GloFo will be able to achieve with its Zeppelin die revision. Even better question. Why the display racks (Both EPYC & Radeon Instinct) NOT connected to a power source. Surely they could have run a power cord all the way on stage. Because the PCI-E GV100 was also announced ay ISC, 28 TFlops of half precision and 14 single. 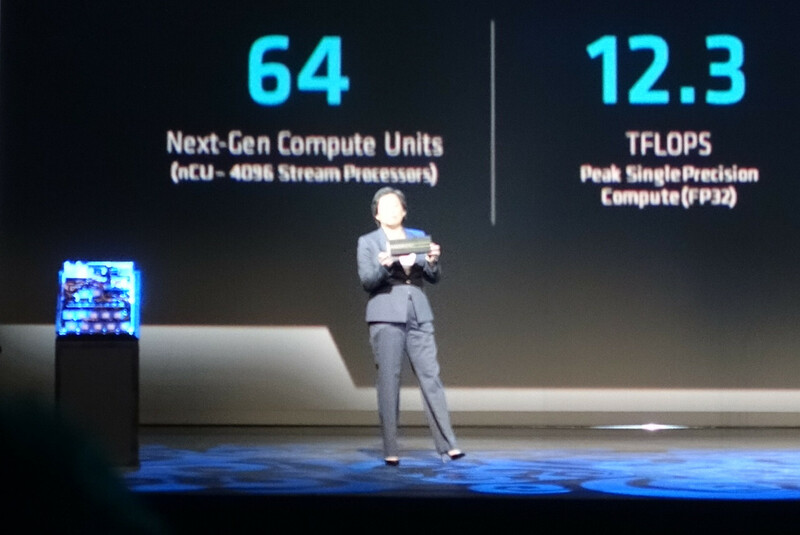 All at 250watts... Oh, and 900GB/s Memory bandwidth? Is that an Nvidia sales lie? Weren't we expecting about 13.1 TFLOPs? 12.3 TFLOPs is respectable but...disappointed. It's most likely running at lower clocks than anticipated. Edit: And 300 watts? Ouch! I know what you say, but altough the display purpose of the rig, why the heck you announce a partnership with a builder and then show a mashed together unit? Pretty sure they had to tweak it in order to reach their desired FLOPS/watt target range. It was 12.5 on announcement last December. 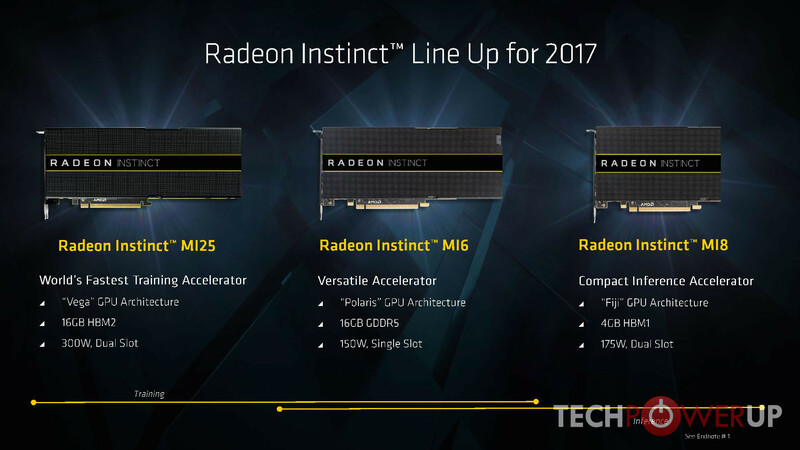 13.1TFlops is for RX Vega FE and probably it liquid cooled version with over 300W TDP. These are "passive" cooled server parts, with targeted tdp of 300W so clocks are tuned down a bit. With those Tflops gpu is ticking on 1.5 GHz, while frontier edition is up-to 1.6 GHz. I think it was the configuration they were announcing. At least that's what I got from the video. If you look closely. Not all GPUs are connected. I suspect (I could be wrong) these are showcase GPUs and they usually are swapped around depending on how they want to display them at shows. 300W? AMD might hit big on the professional market but in gaming Vega seems to be an utter failure.